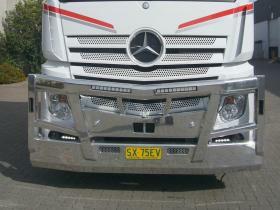 Mercedes Actros 2658 Wild Bar Design FUPS hi-tensile aluminium road train bullbar. Designed using heavy wall rectangular hollow section bars and heavy wall box uprights to give maximum protection. Mounted using a high tensile aluminium backing plate with 35mm tow pin. Custom built heavy duty main lower channel to suit factory fitted radar. Indicator/daylight running lights mounted in outer uprights. Dangerous Goods sign and provision for removable Road Train signs on the outer area of the top rail. Poly Carbonate protector covers fitted to protect headlights. Mercedes Actros 2017 Wild Bar Design FUPS hi-tensile aluminium bullbar with 100x100mm heavy duty 6mm wall high tensile aluminium box uprights. Designed using heavy wall rectangular hollow section bars and custom designed outer reinforced 6mm wall high tensile pipes to give maximum protection. Mounted using a high tensile aluminium backing plate with 35mm tow pin. Custom built heavy duty main lower channel to suit factory fitted radar. Indicator/daylight running lights mounted in upper custom bar. Centre top bar is fitted with recessed LED light bars. Number plate is recessed into the lower main channel. 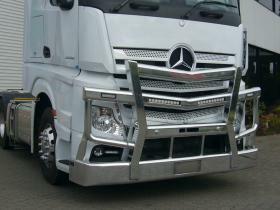 Mercedes Actros 2018 Wild Bar Design FUPS hi-tensile aluminium road train bullbar. Designed using heavy wall rectangular hollow section bars and heavy wall box uprights to give maximum protection. Mounted using a high tensile aluminium backing plate with 35mm tow pin. Custom built heavy duty main lower channel with radar. Indicator/daylight running lights mounted in outer uprights. LED Bar driving lights fitted to top channel Reversable Over Size signs plus provision for removable Road Train and Long Vehicle signs. Poly Carbonate protector covers fitted to protect headlights. Mercedes Actros 2017 Wild Bar Design FUPS hi-tensile aluminium road train bullbar. Designed using heavy wall rectangular hollow section bars and heavy wall box uprights to give maximum protection. Mounted using a high tensile aluminium backing plate with 35mm tow pin. Custom built heavy duty main lower channel to suit factory fitted radar. Indicator/daylight running lights mounted in outer uprights. 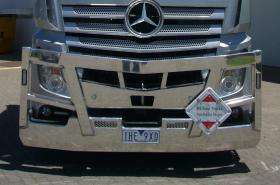 Dangerous Goods sign and provision for removable Road Train signs on the outer area of the top rail. Poly Carbonate protector covers fitted to protect headlights. Mercedes Actros 2017 Wild Bar Design FUPS hi-tensile aluminium road train bullbar. Designed using heavy wall rectangular hollow section bars and heavy wall box uprights to give maximum protection. Mounted using a high tensile aluminium backing plate with 35mm tow pin. Custom built heavy duty main lower channel without radar. Indicator/daylight running lights mounted in outer uprights. LED Bar driving lights fitted to top channell Dangerous Goods sign and provision for removable Road. Poly Carbonate protector covers fitted to protect headlights. 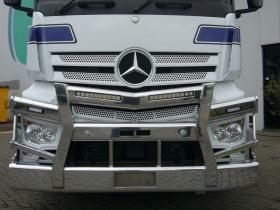 Mercedes Actros FUPS hi-tensile aluminium bullbar. 76mm (optional 88mm) one piece cross tubes through drilled uprights, Contoured main channel, provision available for radar if required. 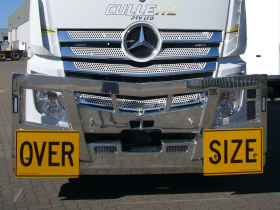 Reversable aluminium Road Train signs. Tow pin and heavy duty steel backing plate or optional heavy duty hi-tensile aluminium (82kg weight saving). Front mudflap mounts. Maximum protection for the long run. Optional coil spring lift assist. Optional poly-carbonate headlight covers. 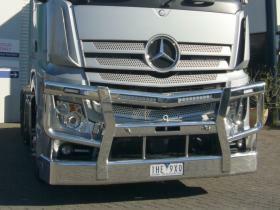 Mercedes Actros 2658 Wild Bar Hi-Line Design FUPS hi-tensile aluminium bullbar with 100x100mm heavy duty 6mm wall high tensile aluminium box uprights. Designed using heavy wall rectangular hollow section bars and custom designed outer reinforced 6mm wall high tensile pipes to give maximum protection. Mounted using a high tensile aluminium backing plate with 35mm tow pin. Custom built heavy duty main lower channel to suit factory fitted radar. Indicator/daylight running lights mounted in upper custom bar. Centre top bar is fitted with recessed LED light bars. Number plate is recessed into the lower main channel. This design gives maximum protection to your investment. 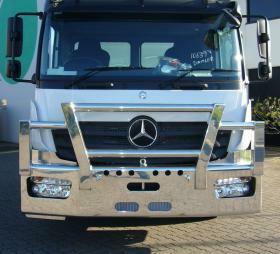 Mercedes Actros 2658 Wild Bar Design FUPS hi-tensile aluminium bullbar with 100x100mm heavy duty 6mm wall high tensile aluminium box uprights. Designed using heavy wall rectangular hollow section bars and custom designed outer reinforced 6mm wall high tensile pipes to give maximum protection. Mounted using a high tensile aluminium backing plate with 35mm tow pin. Custom built heavy duty main lower channel to suit factory fitted radar. Indicator/daylight running lights mounted in upper custom bar. Centre top bar is fitted with recessed LED light bars. Number plate is recessed into the lower main channel. 38mm tow pin in centre bar. 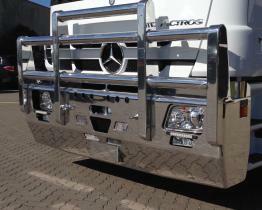 Actros FUPS high tensile aluminium bullbar. 76mm outer contoured pipes from drilled uprights bent to main channel and one piece shaped cross tube through drilled heavy duty uprights, Contoured main channel, provision available for radar . Tow pin and heavy duty steel backing plate. Optional hi-tensile aluminium backing plate (saves 83 kg) Front mudflap mounts. Fog lights recessed in main channel. Indicator repeater to channel outer return. Optional poly-carbonate headlight covers. 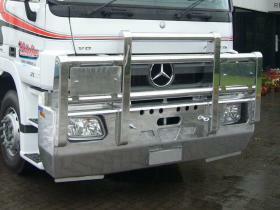 Actros FUPS high tensile aluminium bullbar. 76mm (88mm option) one piece cross tubes through drilled uprights. Contoured main channel, provision available for radar. 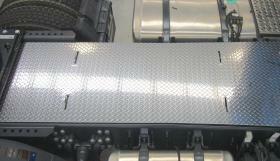 Tow pin and heavy duty steel backing plate, optional hi-tensile aluminium backing plate (save 83kg). Front mudflap mounts. Maximum protection for the long run. Indicator repeater lights to outer channel return. Optional poly-carbonate headlight covers. 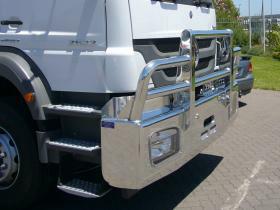 Atego hi-tensile aluminium FUPS compatible bullbar. 100mm box uprights uprights mounted on a custom built contoured main channel and one piece shaped cross tube through drilled heavy duty uprights, Tow pin and heavy duty steel backing plate. Front mudflap mounts. Driving light mounts fitted to suit customer application. 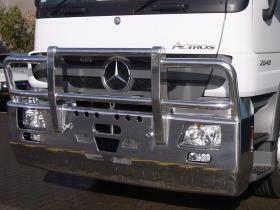 Axor 2633 hi-tensile aluminium bullbar incorporating factory fitted FUPS. 76mm outer contoured pipes from drilled uprights bent to main channel and one piece shaped cross tube through drilled heavy duty uprights, Contoured main channel. Tow pin and heavy duty steel backing plate. Front mudflap mounts. 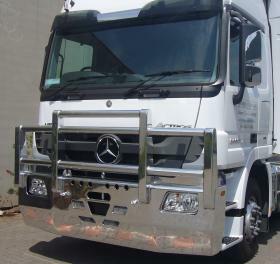 Actros 1844 FUPS high tensile aluminium bullbar. 76mm (88mm option) one piece cross tubes through drilled uprights. Contoured main channel, provision available for radar. Tow pin and heavy duty steel backing plate, optional hi-tensile aluminium backing plate (save 83kg). Front mudflap mounts. Maximum protection for the long run. Factory fitted ndicator repeater /clearance lights to outer channel return. Additional flush mounted indicator repeaters to main bar. Provision for factory fitted radar. Optional poly-carbonate headlight covers. 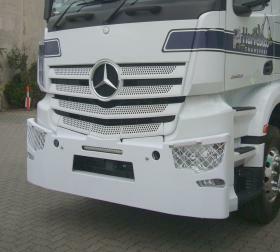 Mercedes Actros heavy duty 10mm high tensile aluminium bumper bar, Powder coated white protruding 50mm in front of the standard bumper bar adding further protection to the trucks front end. Mesh protection for headlights, LED indicators, flush mounted, The Active Brake Assist system is not impeded upon. Custom made aluminium walk plate with recessed slide locks. Easy to remove with top access to locking mechanism ensuring maximum operator safety.